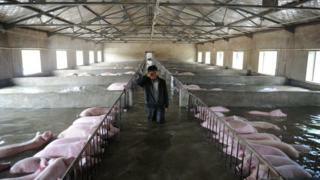 Photographs of two farmers bidding an emotional farewell to 6,000 pigs who they feared would drown in severe flooding in China may have helped secure their rescue. Pictures of the tearful goodbyes spread across social media, with many netizens calling for the animals to be saved. The animals have been partially submerged in the water since Monday, when the farm flooded after heavy rain in Shucheng county in Anhui province. Many dozens of people have been killed in flooding along the Yangtze River after torrential rain, and millions of others have been affected. Initial reports said the pigs could not be moved due to environmental protection and epidemic prevention measures. Now local media report that a team has visited the farm and that the pigs have been rescued. The men in the pictures, named by local media as Li Zuming and Li Jie from the Kang Yuan Agriculture and Ecology Development company, had reportedly raised many of the pigs themselves, and wanted to say goodbye before they left the farm. At the time, they thought they would be leaving them to die. The pictures were shared widely on social media sites like Weibo, where netizens expressed sorrow at the pigs' apparent watery fate. Many also expressed sympathy for the farm employees. "They look sincerely upset," one netizen wrote. "Why is no one taking care of this?" However, some also pointedly observed that the pigs would eventually have been slaughtered anyway - and many suggested that the farmers' distress might have been motivated more by the loss of earnings rather than pity for the animals' plight. Anhui News reported on Tuesday that the Xishang Group, an organisation that operates a food and agricultural business in Anhui, had managed to save the pigs. There has been heavy rainfall in the area since last week. The Fengle river has broken its banks in many places in Shucheng county, flooding many nearby villages. Chinese Premier Li Keqiang travelled to the province on Tuesday to meet residents and local officials. Anhui is amongst the provinces hardest-hit by the flooding in the country. Reporting by the BBC's Rebecca Bailey.